Riverfest 2018 – A festival showcasing all the benefits of the rivers and the hydrosystem. RiverFest will be held Saturday, September 8, from 11:00 a.m. to 3:00 p.m. at east end of Columbia Park in Kennewick, Washington. Fun & Free for the Whole Family! Tri-Cities businesses, community organizations and people of all walks of life throughout the region have joined together to host RiverFest 2018. 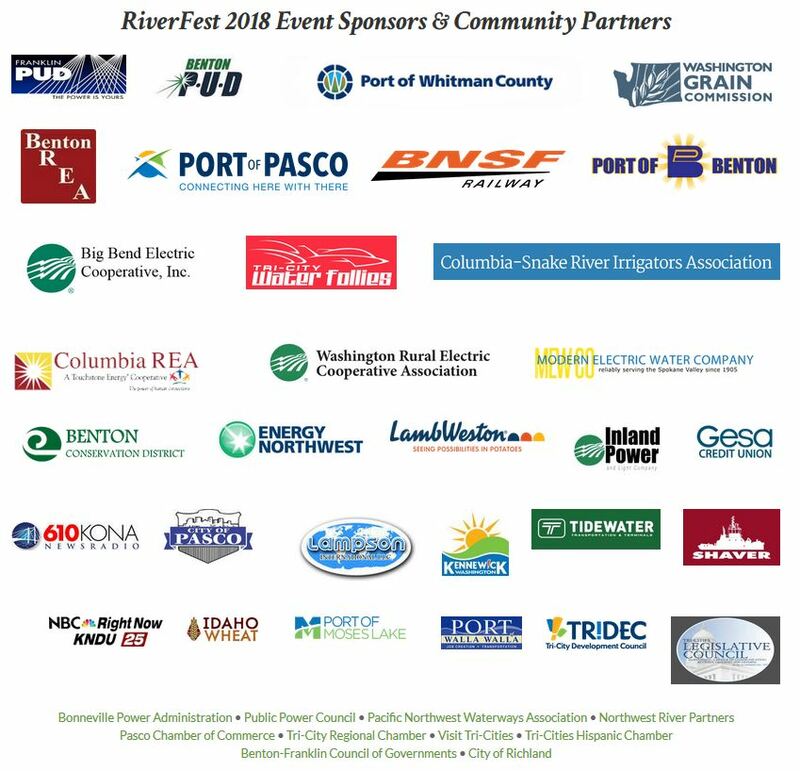 RiverFest 2018, a fun and educational family event, will feature exhibitors, vendors and entertainment to showcase all the benefits of the Federal Columbia River Power System and highlight the four lower Snake River dams including navigation, irrigation, recreation and power. RiverFest 2018 will help raise awareness about the overall hydrosystem, specifically the Snake River dams that are vital to our economy,” said Colin Hastings, chairman of RiverFest 2018 and CEO of the Pasco Chamber of Commerce. The dams are valuable components of the Northwest’s clean, carbon-free, low-cost hydropower that thousands of jobs rely upon. Dam removal would kill jobs, take away clean, renewable power, eliminate river navigation, impair the environment, and hurt agriculture – and there is no scientific proof that removing the dams would actually help salmon recovery. Save the date and plan on attending with your family and friends. Contact the Pasco Chamber of Commerce (509) 547-9755 for more information regarding sponsorships, exhibitors, and vendor opportunities.